The Tipoteca Italiana in Cornuda, about an hour from Venice. n my college years I got involved in letterpress printing, but I was never very good at it. I lacked the discipline and a sense of the quest for perfection. But I loved being in the studio, learning about typefaces, setting type, choosing paper, inking, printing and binding. The college I attended had an important letterpress studio and a carefully managed rare books library. One summer, thanks to a professor, I worked as a printer’s devil — or apprentice — for master printer and typographer Peter Koch, who at the time was still based in Oakland. Printing, books, libraries and bookstores continued nurturing and inspiring me over the years. One summer I did some consulting for the Rizzoli bookstore in New York City. When it came time to be paid I asked only for the display copy of the Helmut Newton “SUMO book” — a nearly 500-page compilation of his photos — that lay in the basement. There was also a time when I wanted to open an Italian bookstore and cultural center in Olga Ragusa’s historic bookshop, SF Vanni, on West 12th Street. Ragusa is a former Columbia University Italian professor, now in her 90s, who lives just above the shop. My idea was to make it a locus for Italian writing and ideas. I even went to Italy to discuss the project with Italian government officials and prospective private donors. But it never got the complete backing it needed. Nowadays, whenever I pass typography studios in Arezzo, Rome, or Florence, I always ask if I can step inside, look around, admire their work, and see the tools of the trade. During a recent trip to New York City I met with Alta Price (such a fabulous name! ), a friend from my Rizzoli days. Price is a translator, printer, calligrapher, and typography specialist who along with lettering specialist Paul Shaw organizes annual summer printing workshops at the Tipoteca in the town of Cornuda, located in the Veneto. This year’s event, Tipo Cibo Vino (Type Food Wine), will also include visits to wineries and cheese farms, cooking lessons, as well as the design and printing of beautiful menus based on the meals participants learn to cook. That encounter — and Carnival season — got me thinking about Venice. I thought about the life of 15th-century Italian humanist Aldus Manutius, who invented moveable type, introduced rules for using punctuation, and even created the earliest versions of the paperback book. He single-handedly changed reading as we know it. 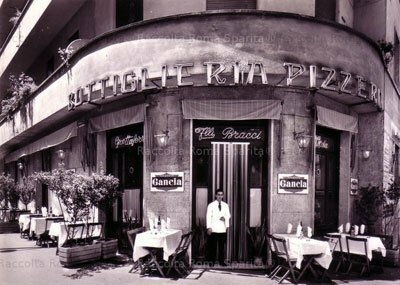 With Alta’s help, and for the benefit of printing and lettering buffs, I’ve compiled a list of places in Venice that are worth a stop at all costs. Fondazione Ciniis a large institute on Isola San Giorgio that hosts major exhibitions and concerts, has a superb library and a rich archive of photographs. This fall, it will host a must-see exhibit of medieval manuscripts. Biblioteca Nazionale Marciana opened in 1560 with a small collection. It now has more than a million volumes, 13,000 manuscripts, and close to 3,000 incunabula (pre-16th century pamphlets), as well as some of the most important English, Flemish, and Ottoman manuscripts, and collections of maps, atlases, prints, musical scores, and Byzantine bindings. Both its locations, the Palazzo della Zecca and the Palazzo della Libreria, are worth a trip. The small island of San Lazzaro degli Armeni , once favored by Lord Byron, is home to a convent that hosts an art gallery, an 18th century printing studio, a rich collection of Armenian manuscripts, and an impressive collection of Egyptian, oriental and Roman archaeological finds. Aldus Manutius’ home is a necessary destination for any booklover with a spine. Stop by the yellow palazzo in the Sant’Agostino neighborhood; it’s marked with a commemorative plaque. Biblioteca Correr at the Museo Correr has a vast collection spanning seven centuries. It’s a renowned center for the conservation of books, has a strong education department, and even offers workshops in calligraphy. The Linea d’acqua bookstore opened in 2002, the brainchild of Marina Perdibon and Luca Zentilini. Its focus is Venice as the cradle of European publishing and bellybutton of the world for typographers, printers, bookbinders and designers in the 15th and 16th centuries. The Olivetti store in Piazza San Marco, commissioned by Adriano Olivetti in 1957, was designed by architect Carlo Scarpa. It is a small and unique space dedicated to iconographic typewriter and chic Italian design of the 1950s and 1960s. The Tipoteca Italiana in Cornuda, about an hour from Venice, is a print and lettering museum, a vibrant workshop and studio, and a hub for contemporary printing in Italy. The 2,000-square meter space and library hosts books by more than 5,000 artists as well as an impressive collection of journals, and rare pieces from Italian foundries. 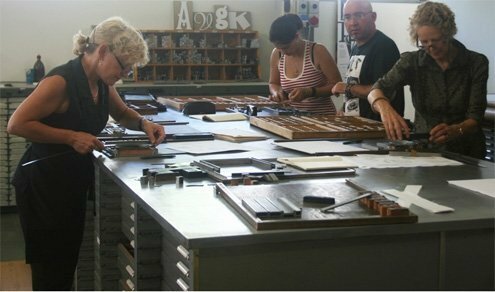 Legacy of Letters Tours , run by New York City-based lettering specialists Paul Shaw and Alta Price, offer workshops at the Tipoteca in Cornuda each summer for those with a passion for printing, letters, books and design. This year’s Tipo Cibo Vino workshop (Type Food Wine) will pair cooking lessons with letterpress printing and is set for mid-July.